'Roads' in East Africa describes a wide range of wheeled-vehicle thoroughfares from the very basic track to black-topped dual carriageways - there are no motorways (or freeways) as we know them. Roads between major towns are generally black-top single carriageways, which you'll only use on the long-haul routes between game parks. All routes within the parks are tracks with the more popular routes graded at irregular intervals, with drainage channels and concreted watercourse crossings (dry for much of the year). This ensures tourists at least get to their accommodation in the rainy seasons. Roads and major tracks are poorly maintained and in many places vehicles drive on the verges for many miles to avoid the pot-holes. At irregular intervals (prior to elections or through foreign aid) money is spent on the roads, but these have a tendency to fall in to disrepair quite quickly. In dry seasons the plains are pretty much dust bowls with dust billowing around you as the vehicles disturb the surface. It's then a choice of whether you open all the windows to clear it quicker or shut them to stop it getting in in the first place. 'Dust-devils' are common. In the wet season roads can become impassable. Luckily everybody is in the same boat and tend to help each other out. This can mean you miss meals at the lodges or have your schedule disrupted. There is little point getting annoyed - just treat it as part of the experience. The most common safari vehicle by far is the two-wheel-drive mini-bus, used by most package tour operators and some of the smaller local agents. They have opening roofs to allow tourists to get a better view and photographs whilst providing a sun-cover. 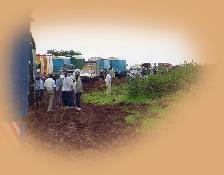 The vehicles have to be in reasonable condition, although wouldn't pass many Western PSV regulations. In recent months the Kenyan authorities have regulated that every tourist must have their own window seat, although this is not strictly adhered to. For smaller or private parties there are a variety of Land Rover or Land Cruiser 4-wheel drive vehicles with customised bodies. These are the mainstay transport for the smaller private game reserves which have to be able to get themselves out-of-trouble. They are usually fitted out as open sided vehicles with permanent covers or have fold-back hatches allowing people to sit on the roof for better viewing (where allowed). The safari vehicles are generally in far better condition than most, whether they be saloon cars or 40 ton long-haul trucks with 30 ton trailers often seen 'crabbing' along the road! The general standard of driving leaves a lot to be desired. Safari drivers however have to pass certain driving standards and wildlife tests before they can be employed. Note, due to the steepness only four-wheeled-drive vehicles are allowed into Ngorongoro Crater, although the ascent road is now block-paved. There are no scheduled bus services in East Africa, except for the long distance coaches between major towns. Taxis are by far the best choice for travelling independently about town. Most are privately owned and barely in roadworthy condition. One of our operators stopped using one driver when he had to borrow a friends car to get us to the airport on time! However, they are preferable to the local matatus - the local unscheduled bus service. Until recently these had a poor reputation, always overloaded and not roadworthy. The Kenyan authorities have clamped down and regulated these in recent years, but that won't improve some of the more basic practices. During one of our earliest visits we decided to go to the local market by matatu. All started well as we managed to get seats. A few miles further on a young woman who had been feeding her baby got on. As she struggled with her bags she handed the baby to our girls and disappeared down the bus. They were left literally holding-the-baby and one of our elderly male travellers was left ogling the woman's bare breast for the rest of the journey. We found alternative transport for the return journey! We booked this instead of an internal flight for a short up-country safari in fly-tents just before our wedding, combining it with a day's trip to Mombasa. On the face of it everything was as you'd expect from an old colonial rail service: first class sleeper coaches; restaurant reservations for evening meal and breakfast; old fashioned guards; white jacket waiter service, with white gloves. The execution however, was very slightly awry: the sleeping berth had no locks on the door; the furnishings were overdue for replacement (but that can also be said of many smaller family hotels in the U.K.); the waiter's gloves and jacket were two sizes too big for him; and, our waiter was three-sheets-to-the-wind before we got on! That didn't stop him spotting an opportunity. He mugged us for a bottle of red wine at KSh1,800 which hadn't travelled too well! We retired to our cabins as soon as dinner was finished to polish-off the bottle of duty-free Scotch I'd brought, turning the trip into our hen and stag-dos! On retiring to our own cabins, Alison was afraid we would be robbed overnight and had me holding the window up with my foot and the door handle shut with my hand every time we stopped! As every small village has its own station and the train stops at them all you can imagine I didn't get much sleep. In the morning we caught a glimpse of Kilimanjaro in the distance as we ate breakfast. Whenever we pulled into a station children came running and shouting out of the bush from miles around. It was a relief when we were finally met by our hosts at Nairobi! As we've already experienced the roads and train we now tend to fly as much as possible, giving us more time on safari - which is what it's all about! There are scheduled flights between most major towns with their own airports and smaller craft to the more popular safari destinations as they use more basic airstrips. Unfortunately the airlines seem to find it difficult to remain viable, with many going out of business. 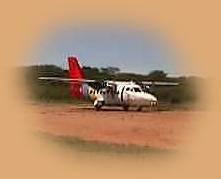 Regional Air (a BA partner) provided scheduled flights to and within Tanzania. The planes tend to be two or four engined turbo-prop aircraft which can be quite noisy. Note baggage allowance on these craft maybe as little as 15 Kgs (33 lbs) per person including all hand luggage. This may pose problems for international travellers on long safaris! We have a good meet-and-greet service provider who we leave a bag with while on safari. We swap bags when we travel to the coast. Please resist the urge to clap and chear on landing! You may also need to charter your own flights for the private game reserves or to suit your program without overnight stops in town. As you may expect these can be rather small aircraft, often single engined which can be less stable, especially flying over the highlands. I have often flown in the co-pilot's seat. One advantage of charter flights is you can often get a flying safari in on the way if conditions are right and the pilot has time. All charter companies are based in or around Nairobi and Arusha and therefore routes tend to pass through one of these airports. International flights land at a few airports: Nairobi - for scheduled services to Kenya; Mombasa - for charter flights used by most package operators to Kenya; Kilimanjaro or Dar-es-Salaam to Tanzania. Although operators advise visas are required before travelling, these can be purchased at the airport with hard currency (US$, � Sterling are accepted in both countries) with no more delay than for baggage, which is far easier than applying to your local embassy. Kenya now allow travellers to pre-purchase visas on-line - follow this link.